VANCOUVER—Public hearings on the Enbridge pipeline begin in Vancouver this Monday and will be greeted by a broadening spectrum of community members determined to voice opposition in the streets and inside the hearing room. Building on the trend set in Victoria of more people showing up in the streets than in designated viewing rooms, a large noise demonstration will march through downtown Vancouver in support of the self-determination of Indigenous communities and their rights to say no to oil and gas pipelines across their territories. 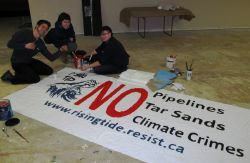 Communities from all across British Columbia have rejected the proposed oil sands bitumen pipeline. However, the Harper government is doing everything it can to ignore the demands of affected communities and undermine democratic process. In light of the recent passing of Bills C-38 and C-45, many feel the review process is only important as another venue to show the strength of public opposition. The environmental impacts of a project like the pipeline—from potential oil spills to its contribution to climate change—are matched by its social and economic impacts on affected communities: displacement, loss of traditional economic activities, and undermining self-determination. Around the world, Indigenous and other frontline communities—those least responsible for today’s global ecological crisis—are hit hardest by climate change, and burdened most by the corporations causing this crisis. WHO: Public, child and family friendly event.